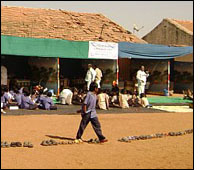 This is a brief chronological account of my trip offering volunteer medical services to the children in poor and un-reached communities in India between January 04, 2008 and March 28 2008. I would like to acknowledge and thank The Benjamin H. Josephson, MD Fund and Overlook Hospital for offering their financial support for this undertaking. Hampi is a small remote town in one of the southwestern states of India. While visiting my disabled cousin, I suggested, that if she could gather some children from poor families who needed medical attention, I would be glad to examine them. On the first day, she arranged to meet a few children at a nearby temple hall, having spread the word to local contacts of hers. I was shocked to see a steady flow of children from 9 am through 3 PM without a break. We had to turn a few away telling them to return to her home after 4 Pm. Then it continued till 9PM!! I had examined almost 70 children! Needless to say, I was excited as well as exhausted. Next two days, parents stood outside her home at all hours of the day. I managed some "consultations" as well. The selected location was outlying villages in central Gujarat state. I had participated in planning a weeklong annual medical camp, under the banner of "Share and Care charitable Foundation". This foundation, based in New Jersey is in its 26thyear. All together, there were eight more physicians volunteering from USA. Most of the villagers were below poverty line without running water, electricity or transportation. About one thousand children ranging in age from 5 yrs. to 18 yrs. were examined and treated appropriately. All of them were students in boarding schools. The school enrollment, attendance and continuation of studies are generally very poor. Parents enroll students at such hostels to take advantage of government subsidies, how so ever meagre. These subsidies help provide some form of bedding, meals, school fees, supplies and clothing for their children. We had been to one of the three schools last year and were inspired to observe the difference our intervention has triggered. This NGO was founded in 1982 by a physician couple returning from UK, in order to serve the under priviledged and un-reached in rural India. While their activities are multifaceted and cover a large number of tribal villages, I was involved in providing primary health care services and training non- medical health care workers in providing very basic health care to the people in remote villages. These people are very poor, illiterate and living in abject poverty and all its ills.